Actress Margot Robbie is clearly a fan of characters that are a little off kilter; Tonya Harding, Harley Quinn and now Annie in writer/director Vaughn Stein's feature film debut Terminal. The stylish thriller unfolds at a nameless terminal in a nameless city in an undisclosed period though from the technology on display, it's likely the 70's though it may as well be a dystopian future; it makes little difference to the movie outside of adding to the unique look. Robbie plays Annie, a waitress at a diner who loves to talk to people. It's here we first meet Bill (Simon Pegg), a dying teacher looking for a little pity and perhaps a bit of help ending his life before it the pain becomes too much. Annie has a second job as go-between for a mobster who is searching for a new hired killer. Enter Alfred and Vince (Max Irons and Dexter Fletcher respectively), a team of killers-for-hire applying for the hitman contract. To say anymore about the story would be spoiling it but it's worth mentioning that Terminal revels in the double cross. It's not immediately clear how the stories all come together and for a while, I wasn't sure why I should care bout Bill and how he played into the story of Alfred and Vince but I was mesmerized by Robbie who has far too much fun with the slightly unhinged Annie, first offering ideas on how Bill could end his life before offering up her services helping with the act. Stein is clearly going for the building mystery and though the movie eventually comes together, Terminal manages to get there thanks in large part to the magnetism of the cast. Robbie and Pegg have a fantastic chemistry which keeps the movie going before Fletcher and Irons step in to take over with their shtick of young buck with all the new ideas and old guy who is set in his antiquated ways. Stein has a knack for dialogue and the back-and-forth between the characters is hugely entertaining though all the while, I was wondering where the story was headed. 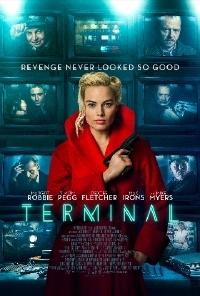 For much of the movie, Terminal is meandering and disconnected with multiple storylines which don't feel like part of a cohesive tale and though an attempt is made in the third act to tie the stories together, it feels more like a weak attempt to justify Annie's actions rather than letting the character simply be the badass she's built up to be. And yet, I found myself completely taken into Terminal with its unique visual style, catchy design and the pull of actors clearly giving it their all and enjoying every second of it. It's a bit messy but ultimately, Terminal delivers a collection of solid performances and an interesting story full of twists and turns that mostly works.